Locked out of your car and need to break in ASAP? Unlace a shoelace from one of your shoes and you've got yourself the only tool you need to open your car door from the outside. 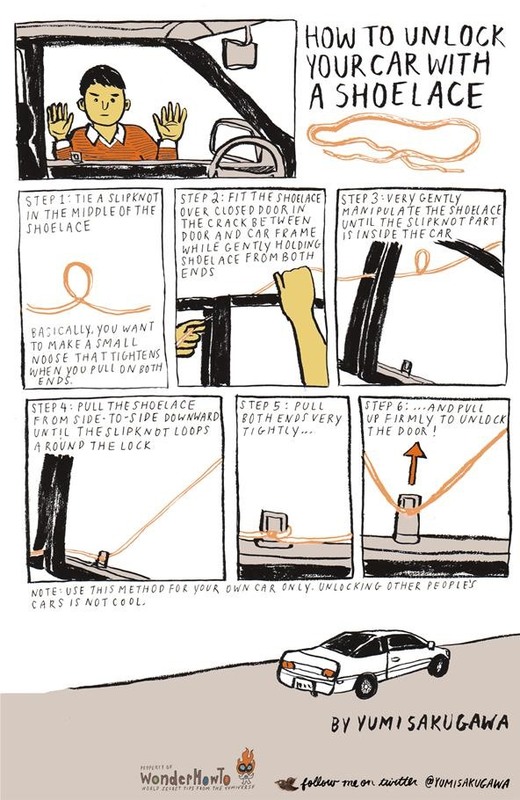 Simply make a slipknot in the middle of the shoelace and pull the slipknot into the inside of the car through the corner crack between the car door and the car frame. Pulling the shoelace from side to side, bring the slipknot down until it loops around the lock's pull knob. Pull tightly, pull upwards, and voilà—an unlocked car in less than a minute. Note: This method does not work for all vehicle makes and models. Anyone try this on a honda civic circa 2000 ish era? Couldn't have explained it better myself. Thanks Justin! Most likely wont be able to on a civic. The lock is by the window switch all the way by the arm rest on the door panel. I don't see how you could do this without the slipknot tightening before it was over the latch. Maybe I am an ogre, though! It's definitely possible. Here's a video of someone doing it. I like how it using something on your person like a shoestring. Very handy idea! And, another good reason to leave flip flops for the pool & beach.